Today marks one month since we started our new series Roxor Weekly, featuring the best Mahindra Roxor videos uploaded to the YouTubes in the last week. You guys have been showering us with videos, so keep ‘em coming because they keep getting better! Tonight’s roundup includes cops, horses, guns, beer, and LED headlights – it’s one hell of a party, and you’re invited. So sit back, relax, and enjoy the ride. But first, if you’re not up to speed on what the Roxor is, why Fiat Chrysler is mad about it, and who Mahindra is in the first place, take five minutes and become an expert on the matter. One of the highest-viewed Roxor videos to date dropped last week, courtesy of 223k-subscriber channel Stanley “Dirt Monkey” Genadek. It’s chock-full of things we love: mowing down weeds, climbing steep grades, and driving all over the well-manicured grass of a quaint suburban area. We’re living vicariously through you, my friend. The highlight comes at around 12:30 when Stanley’s friend Danley gets pulled over while driving the Roxor in a field. Which isn’t all that surprising, considering that to an officer it looks like he’s driving a Jeep through somebody’s yard! I won’t ruin the surprise, but unsurprisingly the officer has no clue what a Roxor actually is. This short film tells the story of Sean O’Bryan and his family farm, Celtic Ridge, just outside Flint, Michigan. It’s a poetic tale of one family’s passion for breeding horses and the quest to raise their children into a simpler life. And save for a few images of a gorgeous blue Roxor doing farm work, it doesn’t feel like a product placement at all. In fact, the words “Mahindra” and “Roxor” are never said. But that moment never came, and while I’m sure at least a few marketing executives at Mahindra are muttering about how this video’s sales pitch “isn’t aggressive enough,” this format portrays Mahindra as an honest, straightforward, no BS sort of company, and amid the recent PR shitstorm between them and FCA, that’s exactly what they need. 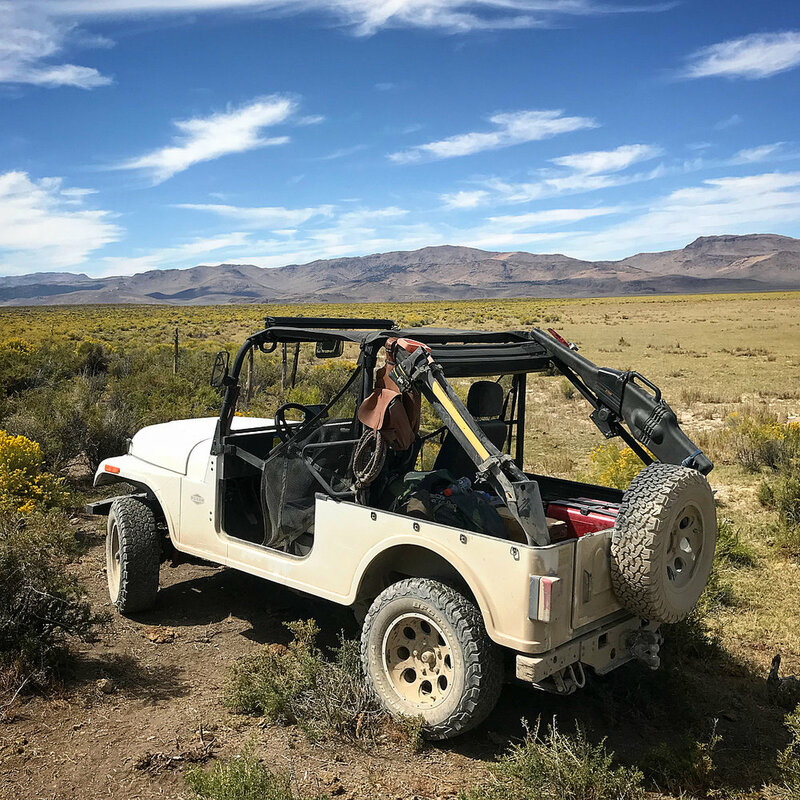 This video comes from Bear’s End Productions up in beautiful second-amendment-loving Montana, where this Mahindra Roxor is legally licensed for use on public roads. It’s also been chipped to remove the speed limiter, something you don’t need a chip to accomplish, and it so closely resembles a Jeep on the road that it even gets the wave from a passing Jeep driver. The narrator says it’s probably wise to avoid the interstate while driving a de-restricted Roxor, and there’s talk in the comments of possibly trying to enclose the cabin for those harsh Montana winters. For now, a Roxor-specific bikini top provides some shade for the occupants. In a short second video , Bear’s End describes how they purchased some Mile Marker hubs for a 1968 Jeep CJ-5, and guess what? They bolted right up to the Roxor without any issues. How neat is that! Remember Dan from the Dirt Monkey Garage video? He’s back again on his own channel, Tools in Action, with a tech video that walks through how to replace the Roxor’s candle beams with more powerful LED headlights. This install video features some 7” round LED headlights. They have great reviews and are rated at over 5000 lumens, roughly 4999 more than the stock lights produce. But fair warning: you’ll have to do some damage to install them, since the Roxor’s headlight buckets are a little too narrow for these LED lights to fit. Rest assured, the work needed isn’t that bad and isn’t visible from the outside. Dan uses a fantastic gadget called a Hitachi Nibbler to remove the inner lip from the stock headlight buckets in seconds flat, letting the new LED housings sit flush within the buckets. The stock beauty rings and watertight gaskets still fit perfectly, and the finished product is a custom touch that looks right at home on a Roxor. Youtuber Arizona 1266 has found an attractive solution for making his Roxor street legal. Besides a title, tag, and registration, the major item a street legal Roxor needs is a set of turn signals. Any off-the-shelf signals will do, and if you want good-looking and well-built LED indicators, this video shows how a set of flush-mount blinkers from Rigid Industries really fits the bill. The narrator mounted these blinkers flat against the front and rear bumpers, their black housings blending in nicely with the Roxor’s black bumpers. They’re running off 14ga wires that pass through the firewall and interior, terminating at a generic three-way switch dangling from the steering wheel. An EP34 flasher (available at auto parts stores) sets the pace for the four Rigid Industries LED blinkers, which flash brightly even in daylight. The long-term plan is to hook up a more robust turn signal switch (like the Grote switch from our blinker kit), but for the time being this $25 setup works as good as any. 35 seconds is plenty of time to remind you that strapping a weapon to your Roxor is easy, legal (probably), and awesome (definitely). Another week, another Roxor Weekly in the bag. Keep sending us your awesome Roxor videos and most importantly, keep getting out there and driving these babies the way they were meant to be driven.